Meeting with an Old Friend and PIZZA! Click on the photos for a larger view of them in lightbox. I'm back in my home country at the moment, Japan. Since being back I've been meeting up with old friends who I haven't seen for aeons. It's been great reminiscing about years past with 'em again. Just recently I met up with an old school mate of mine. It was great catching up and hearing what's been going on in his life. Not much has changed though. We're both still the same kids that went to school together. Just with a taller perspective of the world, and a little more stubble on our faces. One thing has changed though, his hair! He had recently just got his hair dyed so I hadn't seen his new do. It was RAD! Loved the look, and instantly wanted to take some portraits of him and his mane. We walked by this little pizza place and decided to check it out. It was a pretty neat little hole in the wall place. Ended up eating there and taking some photos of the joint. So here they are! 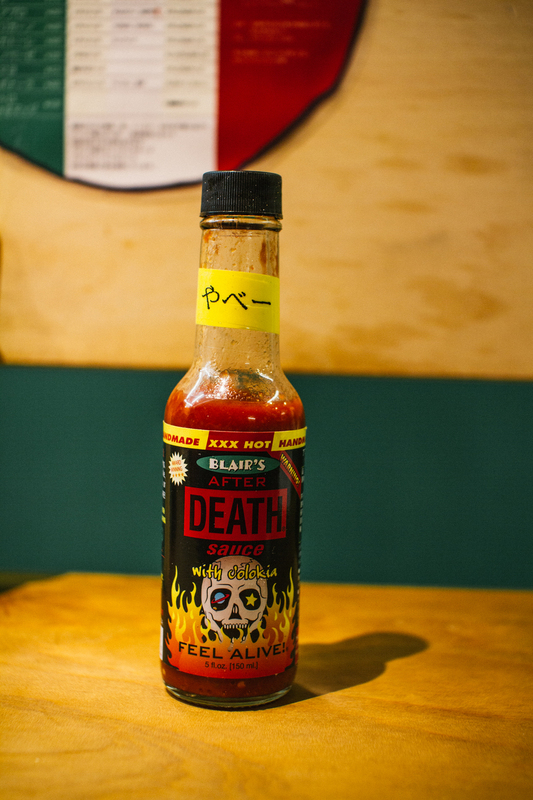 The sticker on the hot sauce says "やべー" which roughly translates to danger! Everything on the menu was super cheap. Most expensive pizza was ¥530 which is around $5.00. Granted they aren't giant but they tasted good and only cost a fist full of change. Tiny place as you can see, but I liked how claustrophobic it was. The next two photos of my friend I got a little carried away and pretty much transformed into my paparazzi form. Don't think he approved of my stalking ways, but the photos turned out good. So there you are, more photos! Hope you enjoyed and I'll be posting more in the future. Check back soon!